recognizing the State Tribal Economic Development Commission as the point of contact to work collaboratively with TAC to expand tourism in Indian Country. Since 2017, tourism activities in Indian Country have continued to grow and still represent a significant opportunity to expand economic development on reservations and across the state. In 2017, 12.5 million people visited Montana, spending $3.24 billion and contributing roughly $4 billion to the overall Montana economy. In 2017, 12.5 million people visited Montana, spending $3.36 billion in the form of direct, indirect, and induced spending, in addition to contributing an estimated $4.7 billion to the overall Montana economy. This activity supported more than 53,000 jobs and generated over $204 million in state and local taxes. Estimates for the previous year show that the number of visitors to Montana in 2016 was 12.3 million. Each visitor spent an average of $147 a day and stayed between four and five nights. This supported nearly 53,000 jobs across many industry sectors, produced $4.8 billion in goods and services sold, and generated $194 million in state and local taxes. 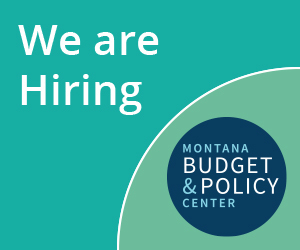 In 2016, visitor spending accounted for eight percent of all jobs in Montana, fifteen percent of all service industry jobs, and eight percent of all retail jobs. 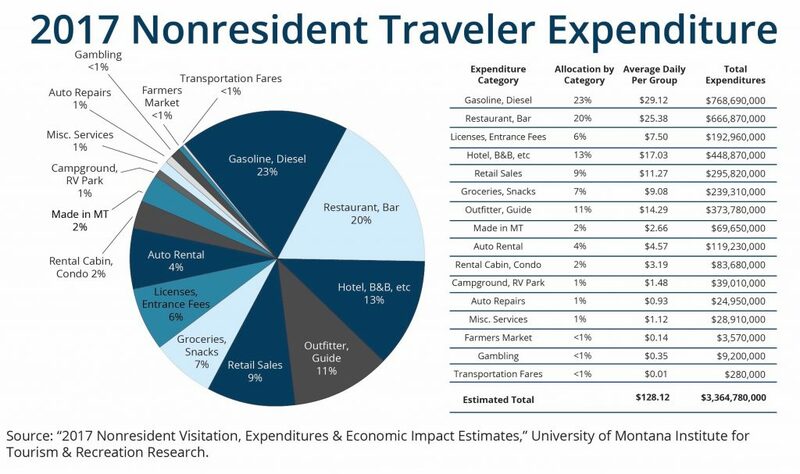 Businesses like gas stations, restaurants, hotels, and retail stores tend to benefit most directly from tourism. In 2017, tourists spent the greatest share of their dollars on gasoline/diesel. Restaurants and bars saw the second greatest share, followed by sleeping accommodations, and outfitters/guide businesses. A breakdown of tourist spending by category for 2017 is depicted in the chart on page 2. Research indicates that consistently the main attractant for visitors to Montana is outdoor recreation, with the primary draws being Glacier National Park and Yellowstone National Park. This is followed by recreation in mountains, forests, and open spaces outside of the parks. In a 2016 comprehensive study of travelers most likely to visit Montana, 46.5 percent reported that they would be interested in coming to Montana to visit American Indian historical or cultural sites. Likewise, a 2017 national survey of potential visitors found that 82 percent of leisure travelers were interested in exploring sites related to Native American culture. In order to help connect these tourists to places and experiences in Indian Country, the 2017 legislature created an Indian Country tourism region, which joined the state’s six existing regions and blankets the state to encompass all of Indian Country. Many tribes are seeking to diversify from single-revenue generating assets like agriculture, coal, or timber to include more emphasis on tourism. From hotels, campgrounds, gas stations, guided hunts, and exhibitions of traditional culture, several tribes have already undertaken a variety of economic development efforts focused on tourism, and others are planning to do more in the future. In addition to the efforts and enterprises undertaken by tribal governments, there are also several individual Indian-owned businesses working to draw visitors to their communities. These businesses offer an array of products and services, including activities like white water rafting, overnight camping in tipis and cabins, and guided cultural tours of tribal homelands. Montana’s new Indian Country Tourism Region is helping maximize the benefits of tourism to enhance reservation economies by supporting the growth of local businesses and increasing employment opportunities. Unquestionably, local tribal members, governments, and business owners are in the best position to understand and identify the unique local landscapes, cultures, recreational opportunities, and events that will help increase tourism in their communities. As tourism in Indian Country continues to grow, it will drive economic growth on reservations, creating new business and employment opportunities. And this is good for Indian Country and for the state as a whole. Montana Office of Tourism and Montana Film Office, “Annual Report 2013-2014”. http://marketmt.com/Portals/129/shared/docs/AnnualReports/annualReport14.pdf. Direct spending is defined as the purchase of goods and services. Indirect spending is the purchases made by travel-related businesses, and induced spending is purchases by employees in travel-related occupations. Kara Grau, “2017 Nonresident Visitation, Expenditures & Economic Impact Estimates,” University of Montana Institute for Tourism and Recreation Research, 2018, https://scholarworks.umt.edu/cgi/viewcontent.cgi?article=1368&context=itrr_pubs. Kara Grau, “2017 Nonresident Visitation, Expenditures & Economic Impact Estimates,” University of Montana Institute for Tourism & Recreation Research, 2018, https://scholarworks.umt.edu/cgi/viewcontent.cgi?article=1368&context=itrr_pubs. 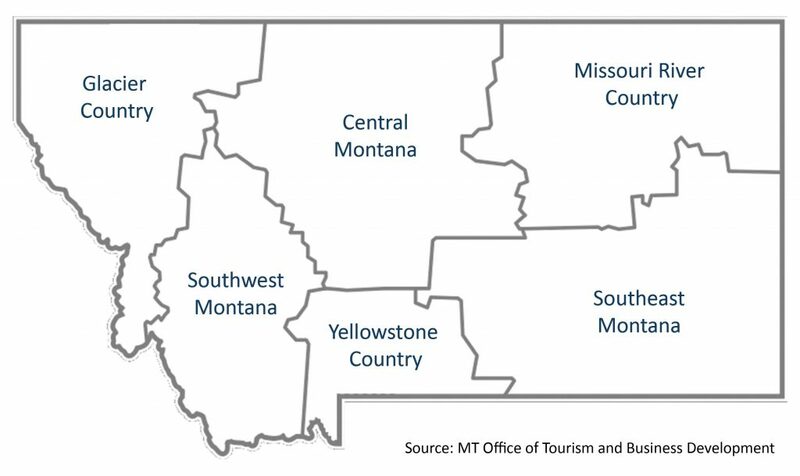 Institute for Tourism & Recreation Research, “Economic Snapshot of Montana’s Travel Industry,” University of Montana Institute for Tourism and Recreation Research, 2015, http://itrr.umt.edu/files/2016EconomicReview.pdf. Destination Analysts, Inc., “Montana Brand Research.” http://www.marketmt.com/Portals/129/shared/docs/pdf/brandResearch.pdf. “Montana officials reinvigorate efforts to boost tribal tourism,” Missoulian, June 18, 2018. https://missoulian.com/news/local/montana-officials-reinvigorate-efforts-to-boost-tribal-tourism/article_c50a5e9c-3dbf-5cd9-9ad9-87011ea1e900.html.